Burr elm veneer with rosewood edging & inlaid lid. Satin finish, fitted with brass feet. 1 tune 18 note movement with revolving ballerina doll. A selection of tunes are available to choose from when ordering below. These beautiful hand crafted jewellery boxes have a ballerina figurine that revolves as the music plays. 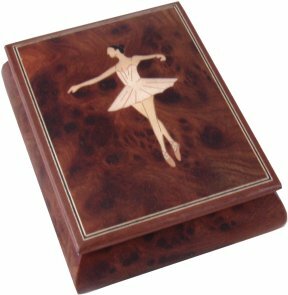 These wooden boxes are finished in gorgeous burr elm veneer with rosewood edging and a Ballet Dancer inlay. Open to reveal the velvet lined compartment and play the musical movement as the ballerina doll turns. For more information on the musical movements used, please click here.